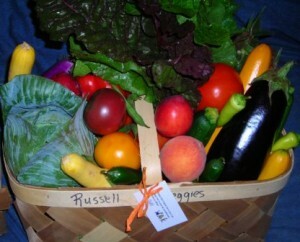 We offer a “Basket of the Week”, which is our local grown product and are growers choice items. These baskets are filled first before any other produce is sold, they are our first priority and we go to the market extra early to prepare them just for you. The baskets weigh between 27 -32 lbs. depending on veggies and the cost is $32. We will gladly add fresh-free range eggs for an additional $3.50. We provide the basket each week, but do expect you to return them on your next visit. It includes what is currently in season, and has veggies and fruit when available. You are not obligated to purchase every week as a CSA ** but they will be available each week via pre-order only. Believe it or not, the larger basket is about perfect size for a family of 4 (2 adults and 2 children) if you cook most nights. Along with your basket you can also get recipes from our website to help enjoy your veggie purchase. However, if you ever receive produce you are unsure of, please inquire and we will be happy to tell you about that item. Kohlrabi often take folks by surprise. We have had request for “Single” size for some of our customers, we are going to try and accommodate them as well. We will have a smaller size basket, it will be in the peck basket, which is 1/4 bushel. 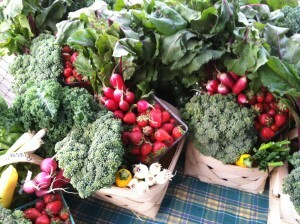 They weigh between 14-17 pounds, depending on veggies included and will be half the price, $16. 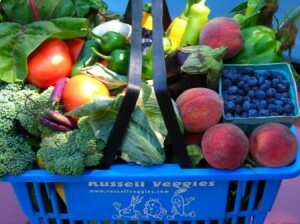 Baskets are available by pre-orders ONLY, via e-mail @ val@russellveggies.com and Face Book Message, https://www.facebook.com/pages/Russell-Veggies/140889669283756. Please be sure to include a contact number with your order. Baskets should be picked up on Saturdays between 8-11:00 at the New Albany Farmer’s Market; located on the corner of Bank and Market streets in beautiful downtown New Albany. Baskets not picked up by 11:30 will be sold unless prior arrangements have been made. Our veggies are as naturally grown as possible, 0n our veggies like broccoli, cabbage and cauliflower we use Diatomaceous Earth (DE), which is 100% organic. We found that this worked fantastic this year and will use as needed on our other veggies. Our fruit is never sprayed after the bloom sets, and no chemical process is used as a preservative. That’s why the shelf life is not that of the grocery stores. Find more information about our farm on our website… http://www.russellveggies.com/our-farm/ Again, thanks for the inquiry and I hope this information was helpful. ** CSA ~ Community Supported Agriculture ~ this is where you invest your dollars in the spring and reap the benefits of a certain farmers yield throughout his growing season. CSA are generally delivered/picked up on a continuous weekly basis.